Reno's Idlewild Park is a beautiful open space just west of downtown. The park hugs a curve along the south bank of the Truckee River and is a vision of green with its mature trees and large expanses of grass.Idlewild Park is the site of Reno's annual Earth Day celebration. 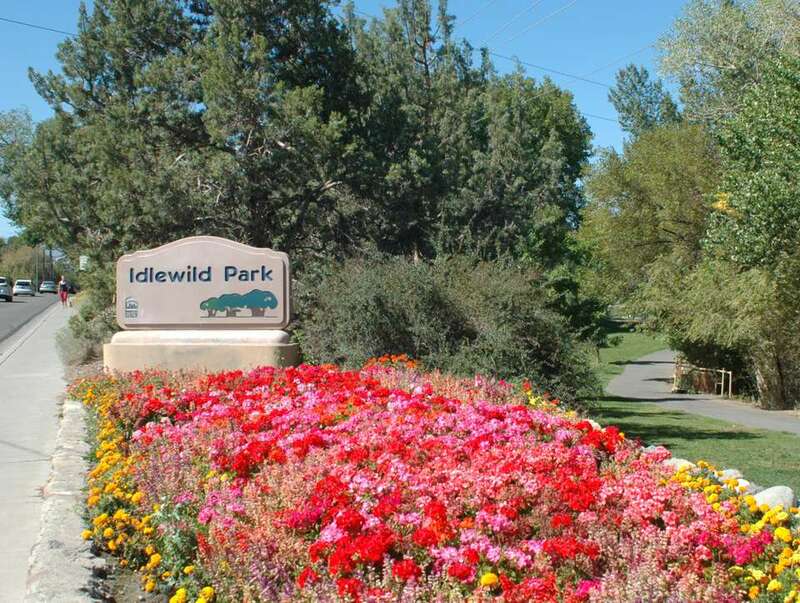 Idlewild Park has three rentable areas (Rose Garden, Large Terrace, and Snowflake Pavilion), children's playgrounds, a skate park, swimming pool, walking and biking paths, acres of grassy areas for games and sports, a baseball diamond and small lakes. The popular miniature train ride operates during the summer. There is plenty of parking inside the park, though it tends to fill up at busy times like Earth Day. If that's full, there is more along Idlewild Drive. Idlewild Park has other notable attractions. The Reno Municipal Rose Garden is a colorful acre filled with 200 varieties of roses and more than 1,750 rose bushes. Times to view the garden in full bloom are late June to early July and late August. It is free to visit and enjoy. A beautiful public work of art, "Rose Waterfall," is at the Rose Garden. Another interesting piece of public art is located in the small lake closest to Idlewild Drive. It is a mosaic titled "Rainbow Trout Tree" and consists of three large fish together just above the lake's water -- it's hard to describe, but beautiful to see. This work and the Rose Garden piece are both by artist Eileen Gay. The James D. Hoff Peace Officers Memorial provides a remembrance for law enforcement personnel who have given their lives in the line of duty. A path connects this memorial to the Rose Garden. The historic California Building was built for the Transcontinental Highway Exposition held in Reno in 1927. The California Building has been refurbished and looks much as it did during the exposition. It is open to the public and used for a variety of activities in Idlewild Park. Reno's annual Earth Day celebration is held in Idlewild Park every April. Activities center on the California Building on the west side of the park. Idlewild Park and the California Building were gifts to Reno from the State of California, according to the National Park Service. It was the dawn of the age of automobile travel and Reno was suddenly an important crossroads for two new transcontinental highways. Both the Lincoln Highway (today's U.S. 50) and the Victory Highway (old U.S. 40 through Reno, now Fourth Street) were being completed and a big celebration was in order, which turned out to be the 1927 Transcontinental Highway Exposition. The original Reno Arch built for the exposition was moved to Idlewild Park before it ended up at its present location spanning Lake Street next to the National Automobile Museum. Idlewild Park is located along Idlewild Drive. It is bordered by a bend in the Truckee River on the north and east, and Idlewild Drive on the south. Latimore Drive marks the west edge and is also an entrance on that side of the park. The main entrance is Cowan Street from Idlewild Drive. Spoon Drive passes through the southwest corner and provides access to the swimming pool, playground, and ​ball fields. What Activities Can You Do With Your Family in Sparks Marina Park?